It started with a text message back in January 2014 – “We’ve booked Reykjavik for Dave’s stag do”. ***UPDATED 22nd December 2014*** The Guardian have today published one of my photos from this trip on their Guardian Travel Instagram Page. Iceland has always been on my list of places to visit and an old friend’s stag party was the perfect excuse to head over to this beautiful Nordic country. However, I was faced with a little dilemma as I didn’t really want to visit Iceland for 3 days on a stag party and not really see much of the place due to over indulging on Icelandic beer. So the decision was a pretty easy one – I’d fly out 4 days earlier than my friends, rent a car and spend some time touring as large a chunk of the country as was possible within the time I had. I eventually settled on the southwest of Iceland due to the close proximity of the capital, Reykjavik. My friend’s dad who used to be a wedding photographer himself, also came along with me; the plan was to cover as much as we could in 4 full days before meeting friends in Reykjavik for 3 days of “relaxation”. Our itinerary consisted of Reykjavik, Fludir, Geysir, Gullfoss, Eyjafjallajokull, Grundarfjordur, Kirkjufell Mountain, Seljalandsfoss, Skogafoss, Vik, Reynisdrangur and finally the Blue Lagoon. I have to take this opportunity to recommend the car hire company that we used, Ice Rental Cars – we got a fantastic deal with them, they were around 30% cheaper than the more well know car hire companies, it was owned by a father and son team and it gave me satisfaction to know that I was contributing my money to a family run business rather than a large corporate monster! 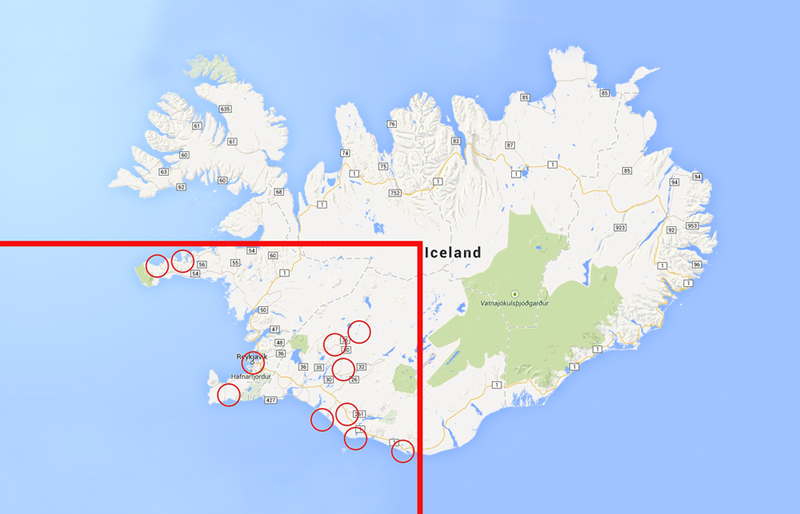 The red circles below indicate the locations of the places we visited within southwest Iceland, as you can see we covered quite a bit of the area within one week. Below is a selection of images from the trip; it’s such a stunning country and I fell in love with the place. I can’t wait to go back and tour the other three quarters. 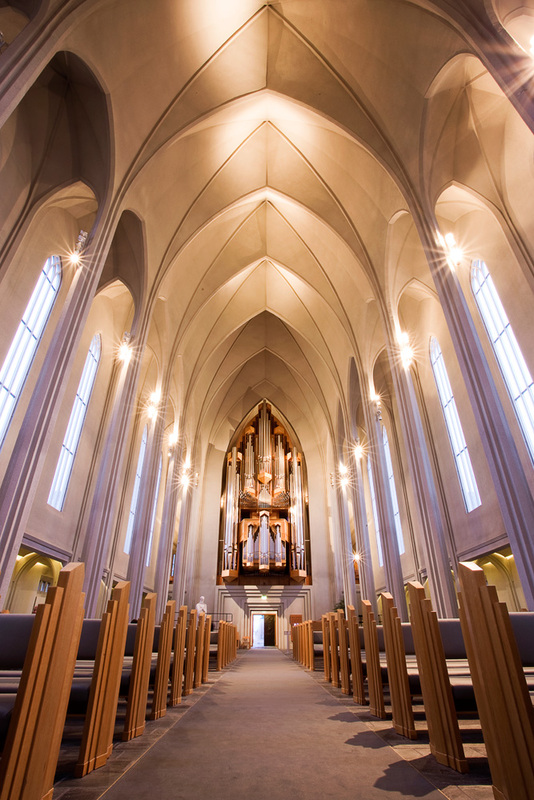 1) Hallgrímskirkja Church, Reykjavik. Such a bizarre structure, kind of brutalist in style with a kitsch beauty. 2) Inside Hallgrímskirkja Church, Reykjavik. 3) This is a lava field about 10km outside of Reykjavik. 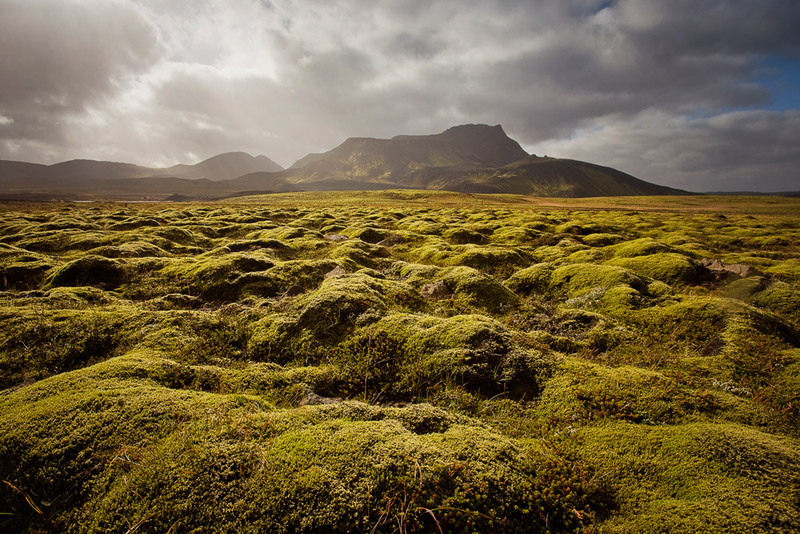 A really spongy moss has grown over the solidified lava. 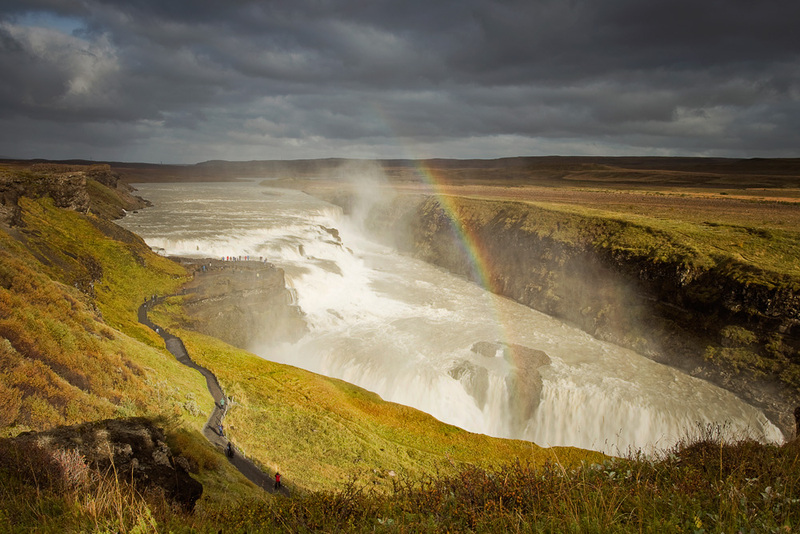 4) Gullfoss, Hvita River. A huge waterfall, it’s difficult to explain the scale of this place. I was lucky enough to capture a rainbow too! 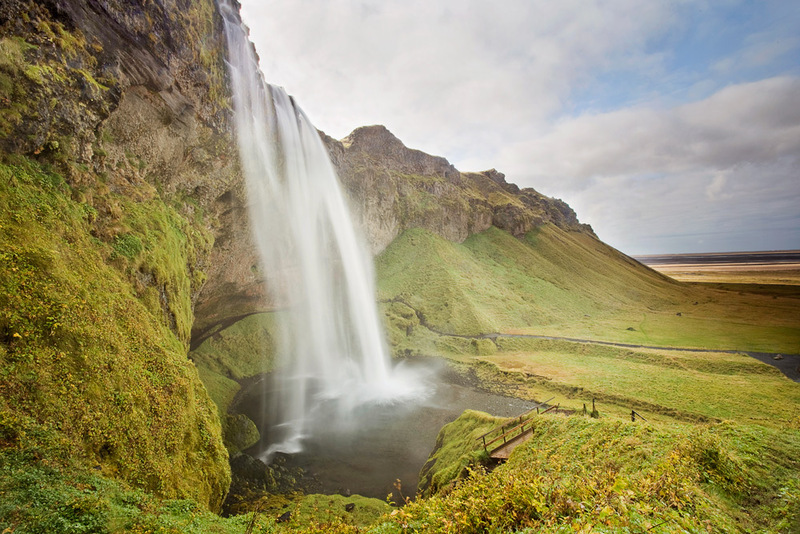 5) Seljalandsfoss, Selfoss. This stunning waterfall drops 60 metres from the river Seljalandsa. 6) Skogafoss, Skoga River. To give you an idea of the size of this waterfall, if you look closely you can see a person in the bottom right hand corner of the image; also, towards the top left hand corner you can see sheep grazing on the cliffs. I got another rainbow too! 7) Eyjafjallajokull Volcano, Skogar. This is the now famous volcano that erupted back in 2010 causing chaos with flights grounded around the world; the mouth of the volcano is just behind the ice-cap you can see in this image. 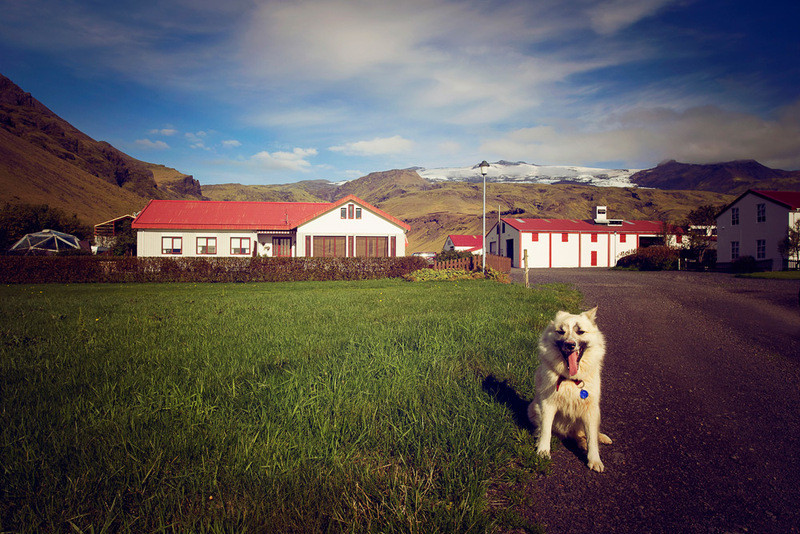 I didn’t realise until I arrived that there was a farm situated right at the foot of the volcano; this is the farm dog (called Viktor) who came to greet us, he was very friendly and posed for his photo. After plenty of practice I managed to pronounce Eyjafjallajokull, in English if you say “Hey, you forgot your yoghurt” very fast then you’ll be pretty close to pronouncing it! 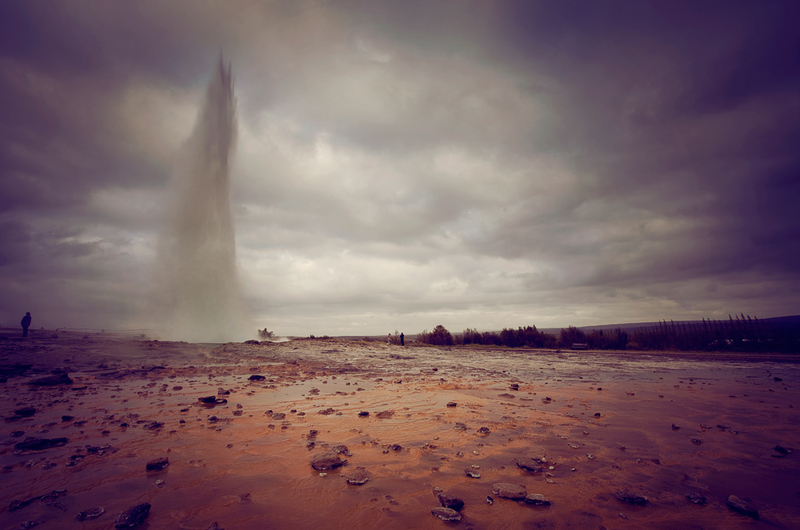 8) Geysir, Haukadalur valley. This geothermal spring erupts approximately every 8 minutes and can fire water up to 70 metres in the air. It’s such a strange place, the orange in the foreground is caused by discolouration due to sulphur that oozes from the ground. 9) Reynisdrangur, Vik. 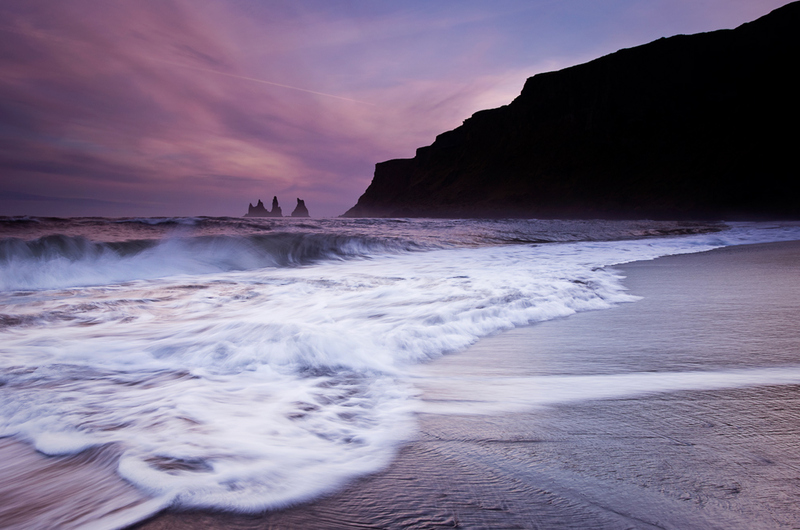 Here are the Reynisdrangur sea stacks, situated on Vik beach about 2.5 hours drive from Reykjavik. The light was like nothing I’ve ever seen once the sun had set, the sky took on a pinkish and dark purple hue which was reflected on the surface of the sea and the wet volcanic sand. As you can probably guess, I got completely soaked taking this shot…about a second after this was taken I was drenched from the waist down! Thankfully I grabbed my camera and tripod a split second before the impact of the waves and held it high above my waistline. 10) Lava Field, Berserkjahraun. 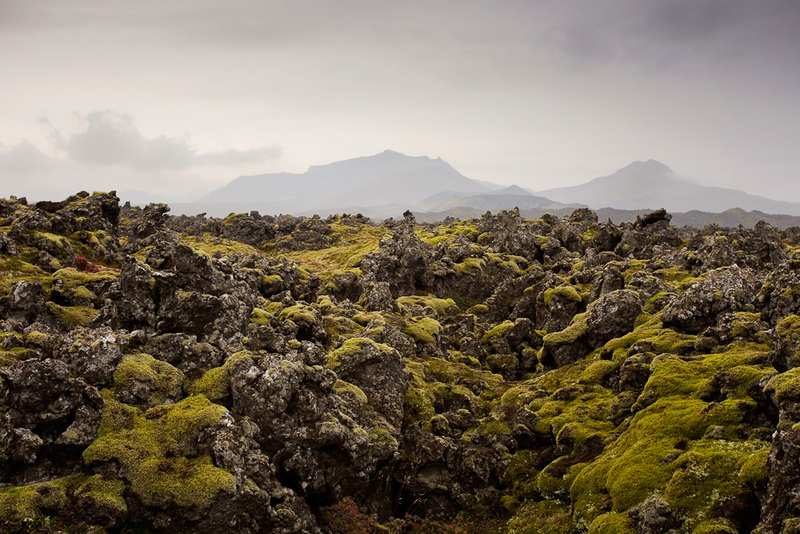 This place felt like being on another planet, the black rocks you can see is actually cooled lava from the volcanos in the distance, a strange green moss has grown over it for thousands of years since the volcanoes last erupted. 11) Kirkjufell Mountain, Grundarfjordur. This is the amazing 463 metre Kirkjufell mountain, a place I’ve wanted to visit for a very long time; I just love the peculiar shape of the mountain. The waterfalls in the foreground flow directly from the Snaefellsjokull ice cap. Although I didn’t get a colourful sunset or any rainbows, the place was still a breathtaking sight. 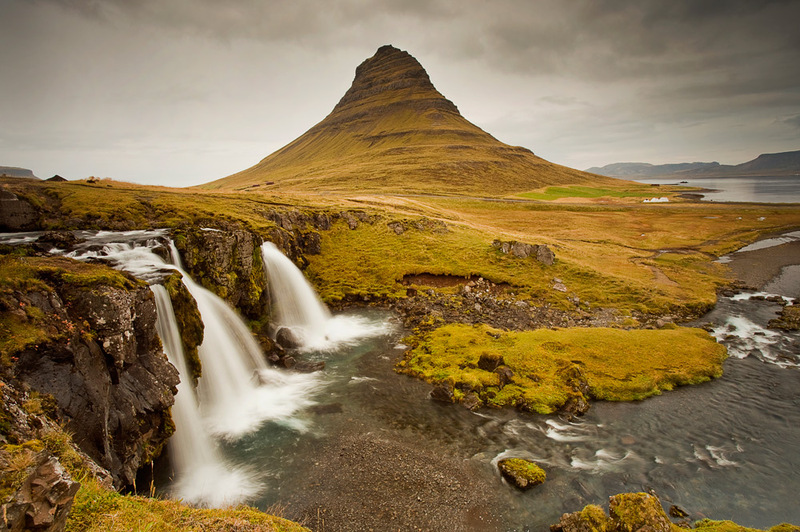 12) Kirkjufell Mountain, Grundarfjordur. Something a little different than the usual shot of this amazing mountain; as there was no wind I decided to capture Kirkjufell reflected in the surrounding waters of the Snæfellsnes peninsula. Imagine living here? If you look closely you can see a house at the foot of the mountain towards the centre of the image; I loved this place, it was so peaceful. A lot of these images are just stunning. 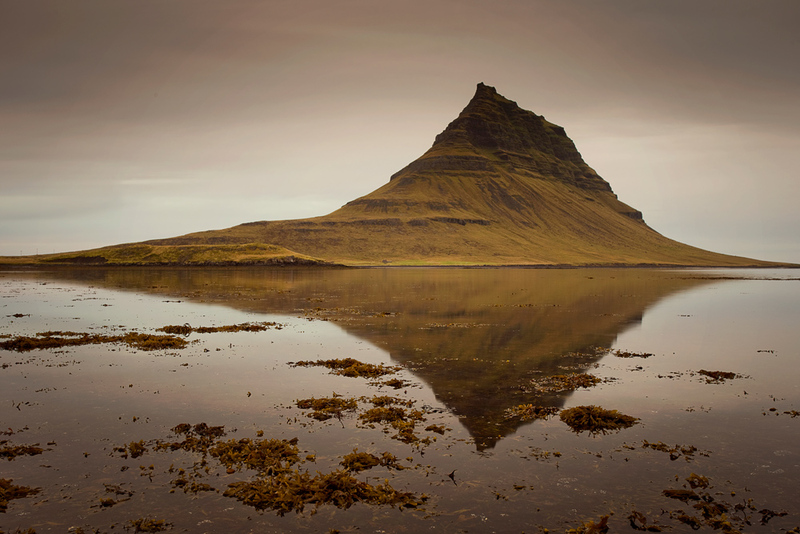 The clarity of the reflection of Kirkjufell Mountain is such that you could almost turn the image upside down. 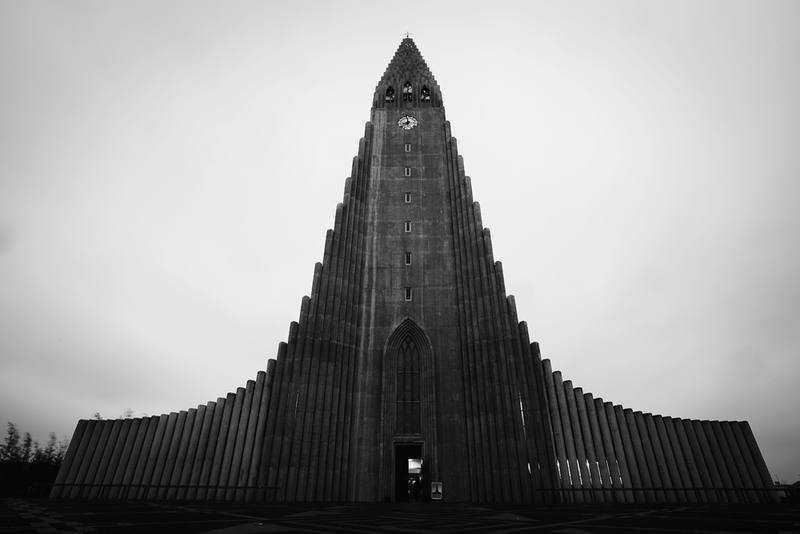 Also thought the photo of the outside of the church in Reykjavik was pretty interesting. Lots space for a stag party. Thanks very much Ken, the church is very cool, like nothing I’ve ever seen before. And Reykjavik is a great place for a stag party too, plenty of bars & clubs. We had a great time. I have flirted with the idea of taking myself off to Iceland for a week as there are such good deals to be had at certain times of year. As of now I haven’t made it but your photos are stunning and hopefully I will get there soon to take my own. Thanks very much Tim, it’s a stunning place. Make sure you do book a trip over there, it’s worth every single penny. The people are really friendly too, wonderful place! I just love your pictures. You have fully justified the beauty of Iceland. I’ve been trying my hands on photography from a very long time but not sure when i would be able to click stunners like this. May be you can give me some tips? 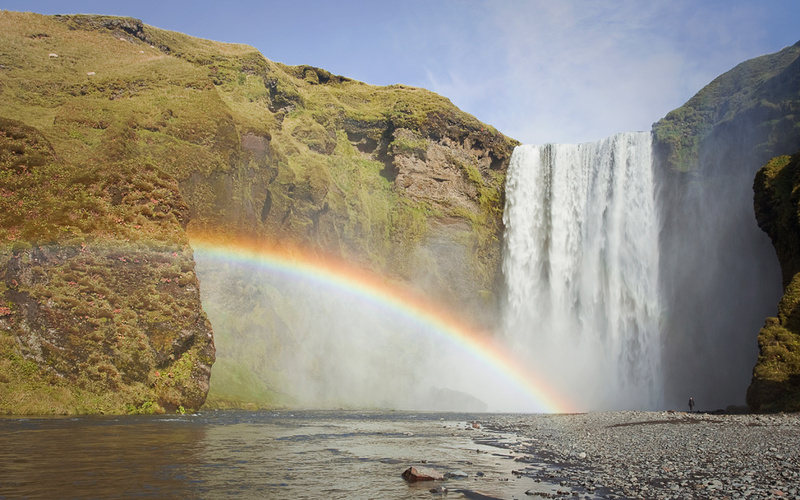 Amazing pictures Steve – when I saw the waterfalls with the rainbow, I thought they were the best but then when I scrolled down, I changed my mind to number 9. All the pictures are awesome and your write-up made me want to pack up and go. Thanks for sharing. Thank you very much Lenie, your kind words are very much appreciated. Make sure you visit Iceland, it’s just amazing! Iceland fascinates me although I’ve never been there. These pictures are beautiful. Thanks Donna, you should visit; I promise you’ll not be disappointed! There are many places on my travel-to list, but Iceland isn’t one of them. Because of that, seeing these incredible photographs and enjoying are captions was doubly wonderful. What a beautiful place! Thank you for sharing. Hi Steve, fantastic photos! Iceland is on my list to do! Those pictures are incredible. I guess the fjords are something else to behold, a natural marvel. You will be surprised that I do not know there is place named Iceland. My knowledge is just till Ireland :). The photography is amazing Steve. 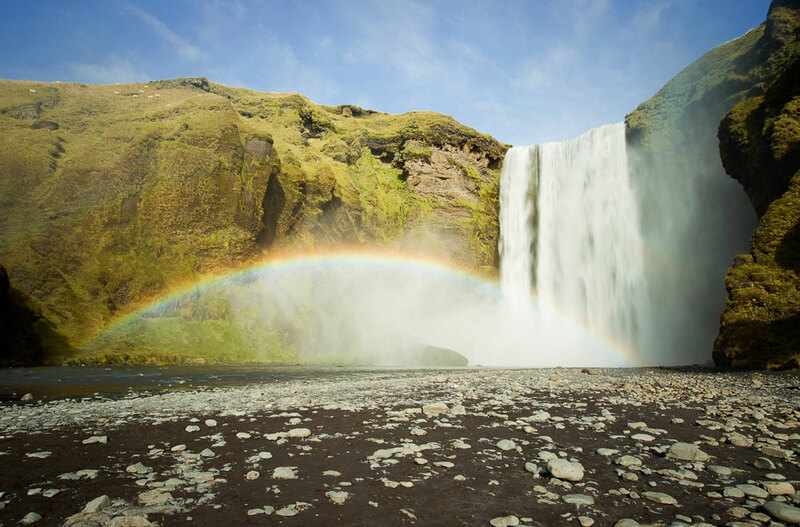 I am amazed to see variation , lava, sulfur, natural fountains, river, rainbow. All different colors of Nature. Fantastic photos. Ruby asks did you find a pot of gold at the end of the rainbow? Great photos, I am currently ten days from my second trip to Iceland. On the first, my lovely powershot s90, developed a fatal fault on the first day leaving me nothing more than my iPhone s4 to do my photography with for the following ten days. I’m going back armed with a Nikon and a couple of prime lenses, this time there will be some real photography rather than just snap and hope. Doing my homework and checking out where I should be going for the best images, thanks for the pointers. I hope to return with something worthwhile. Amazing pictures Steve! Really captured the true beauty of the landscapes!! Literally just came back from Iceland. Seeing all these photos took me back for a moment! I agree with you, country is out of this world! Thank you Rob, it’s an amazing place and I will return one day! We are planning a trip to Iceland, perhaps in May. Thank you for the glorious photos. Iceland looks amazing! Can you recommend accommodation that you used on your trip? Any other ideas would help. We hope to rent a car too but thought we’d pick it up after a couple of days in the capital before doing the ring road. Hi, thank you for your kind comments, Iceland is beautiful. I’ve been to Iceland twice and have stayed in CentreSpot Appartments and also the Rey Appartments. Both were excellent and much better value than a hotel in my opinion. Also, if you are renting a car contact a company called Ice Rental Cars, they are a father and son business (Victor & Siggi) and they provide wonderful service at a much better price than the main car rental companies. Have a lovely time.